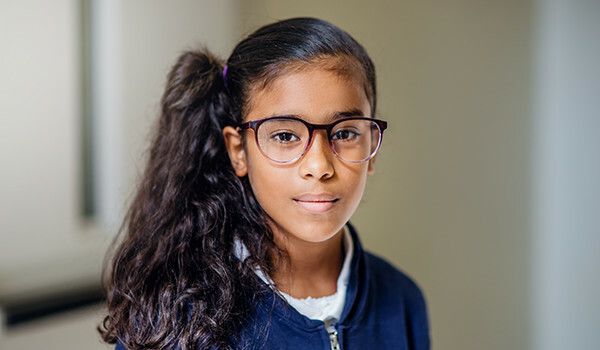 Many children living in poverty in the U.S. do not have the eyeglasses they need to see properly because they lack access to basic health care and vision care. As a result, they face unnecessary barriers to learning and to reaching their full potential. Saint Paul ranks 21 among the 25 cities in the U.S. with the highest rates of child poverty, according to the National Center for Children in Poverty at Columbia University’s Mailman School of Public Health. The Phillips Eye Institute is currently providing vision screenings in the Twin Cities to schoolchildren in kindergarten through sixth grade and care coordination beginning in pre-kindergarten through the start of ninth grade. Helen Keller International’s new program will meet the vision care needs of older schoolchildren in these urban areas. Helen Keller International’s new ChildSight services in Saint Paul will launch at Harding Senior High School, in partnership with Saint Paul Public Schools. The program will provide free in-school vision screenings, eye exams, prescription eyeglasses, and referrals for follow-up care to students who may have more serious conditions. Saint Paul is one of Minnesota’s largest public-school districts, serving a diverse population of more than 37,000 students. Services will begin in Minneapolis Public Schools in early 2019. A grant from Eden Prairie-based Margaret A. Cargill Philanthropies provided funding to expand Helen Keller International’s ChildSight program to the Upper Midwest. Additional support from Essilor Vision Foundation, the nonprofit launched and supported by Essilor of America, provides prescription lenses free of charge and offers discounted manufacturing costs for the eyeglasses provided through Helen Keller International’s ChildSight program in Minnesota. World Sight Day was launched by the World Health Organization in 1998 to draw attention to preventable blindness and visual impairment. In alignment with this year’s theme of “Eye Care Everywhere,” Helen Keller International has charted a bold new vision for its U.S. ChildSight program and aims to recruit new community and corporate partners to bring good vision to underprivileged communities in the 25 U.S. cities with the highest rates of child poverty by 2025. In addition to Minnesota, Helen Keller International’s ChildSight program currently operates in California, Connecticut, New Jersey, New York, and Ohio and will soon be expanding to Wisconsin. Since the program began in New York City in 1994, it has screened nearly 2 million students and provided more than 300,000 pairs of prescription eyeglasses free of charge to vulnerable children. Helen Keller International, co-founded in 1915 by our namesake, is committed to saving and improving the sight and lives of the world’s most vulnerable people. Our programs combat the causes and consequences of blindness, poor health, and malnutrition. We envision a world where no one suffers from preventable or treatable blindness, low vision, or disease. Headquartered in New York City, we currently work in 12 countries in Africa, eight in Asia, and in the United States.